Well, this is interesting, mused the Cowled Crusader, pondering over Infocom games past and present. Hollywood Hijinx is something of a step back in time for Infocom - not in quality, I hasten to add, but in content and style. After all, we've recently had a number of games from the Masters of Adventure, each of which has boasted a new and original storyline with lots of character interaction to boot. Now we have a return to the good old-fashioned treasure hunt. Forget Collossal Cave and Zork. however, because this hunt takes place during the space of a single night spent at your Aunt Hildebrand's luxury Hollywood mansion. Aforesaid Aunt has recently kicked the bucket and left you her millions, providing that you can locate ten treasures within the house overnight. The game starts with you being dumped outside the house without so much as a front-door key, and only twelve hours to come up with the goodies. Despite the old-fashioned scenario. 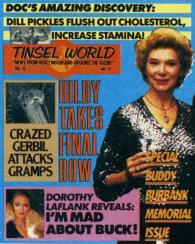 Hollywood Hijinx is a superb game, well up to Infocom standards. It also boasts the biggest maze that the Pilg lias ever wandered through, with about 200 locations. Unfortunately, however, it's not too difficult to find a map to it. though I suspect that that is a drawback for which most players will be profoundly grateful! The game is full of excellent and original puzzles. The vocabulary doesn't strike one as among the largest of Infocom's games: but that may be a false impression. Problems with words and inputs, however, are few and far between. I only have one gripe with this game. Unlike most previous Infocom titles, tins one has a vein of American humour that in one or two instances is quite lost on a European audience. The tricky situations you find yourself in. however, are of universal appeal, so don't let the references to Sonny Tofts e: al put you off.